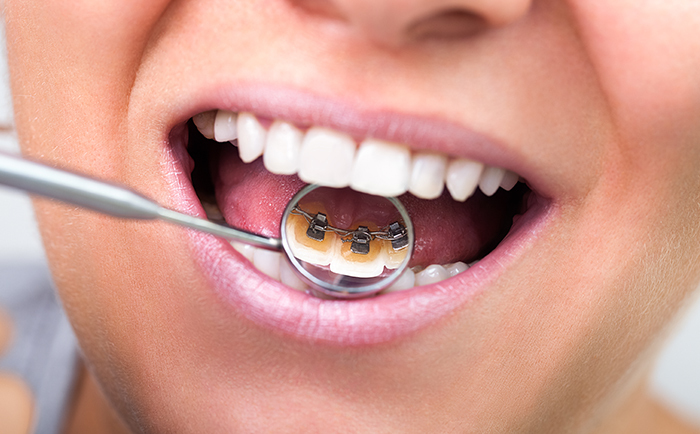 If you are in need of a straighter smile, but the idea of wearing traditional metal wire braces is causing you to hesitate over seeking treatment, there is another option: invisible braces. Clear aligners (also known as Invisalign) are custom made to fit over your teeth. They have been designed to be as discreet as possible – virtually invisible. All the while, they gradually readjust your smile with a soft, constant pressure. The same way traditional braces would. The aligners offer a highly convenient option for eligible candidates who want to correct the position of their teeth without the use of metal brackets and wires. What’s more, you can remove the aligners, which means it is much easier to eat and clean your teeth during your treatment. Lingual braces – or inside braces – are similar to traditional metal and bracket braces, except that they are applied to the inside of the teeth. This effectively makes lingual braces the most invisible of the two discreet treatment options. Lingual braces have the added advantage of being more effective than clear aligners. Are You a Candidate for Clear Braces? While the idea of almost invisible braces is an exciting one, it won’t be a suitable treatment for every patient. Your orthodontist will evaluate your eligibility for clear braces and suggest alternative options, if necessary. So lingual braces and Invisalign are two types of invisible braces that treat the same alignment issues. Depending on the severity of your case, one treatment may be more suitable than the other. Only your orthodontist has the specialist training to advise you on the best course of treatment. How Long Does Treatment with Invisible Braces Take? The duration of your treatment with both clear aligners and hidden braces (lingual) can vary depending on your individual orthodontic circumstances. Your orthodontist will be able to give you a fair estimate of your treatment time, since each person has highly personalised needs. Besides the numerous health benefits of invisible braces, many adults enjoy the cosmetic advantages of these orthodontic solutions. Overall, invisible braces essentially work in the same way as traditional braces would… Placing gentle pressure on the teeth to straighten and enhance their appearance. Book a consultation with Medland Orthodontists in Brisbane and Gold Coast to discuss your treatment options.